Having sailed through the night from Venice, we awoke to the beautiful Croatian countryside. The landscape reminded Elise a lot of her mother’s hometown in northern Maine, Van Buren. A quick breakfast at the Windjammer and we were off to meet our tour group in the theater. If you’ve never been on a cruise before, do yourself a favor. Read the shore excursion tickets THOROUGHLY. If we had done that, we wouldn’t have done an all out sprint to catch up to our group that left 15 minutes before we got there. Luckily we made it down through to the gangway and hopped on the bus just in time. We had quite possibly the greatest tour guide ever. She was very knowledgeable and added some humor to the tour as well. A former teacher, she left teaching to work in the tourism industry in Zadar. One major issue facing Croatia is the lack of skilled workers. As our tour guide said, many people go to college and leave in hopes of finding a better job in Germany or England, but many end up coming back. The problem is finding workers to fill the trades jobs, similar to that here in the US. Each tour participant was given a device with an earpiece so, despite crowd noise and group members who don’t have an indoor voice. This also helps to show everyone you’re a tourist. In case the fanny pack didn’t give it away. 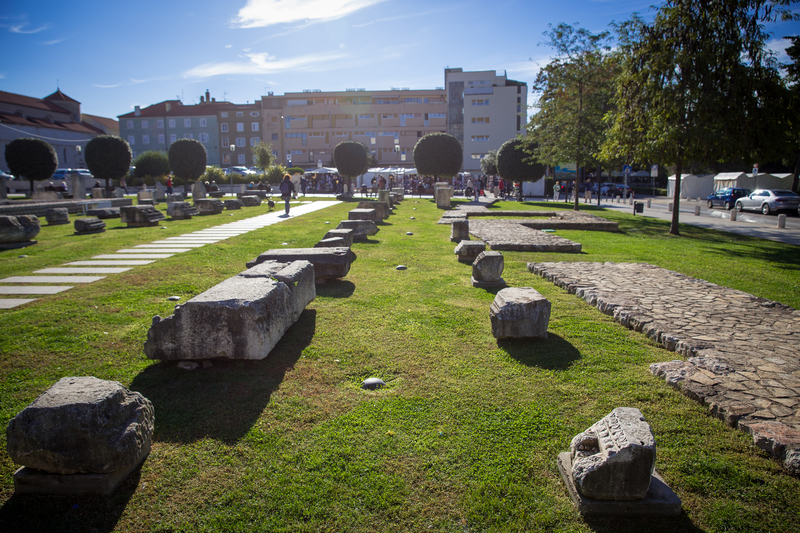 The bus took us from the terminal through the streets about 3-4 miles through Zadar. The city is very clean and has an old world feel, even in the newer areas. It’s odd to see such small cars, but you’d never know it as they zoom around town like they’re in the Grand Prix of Zadar. We drove past a McDonald’s making our way to the waterfront where we were dropped off at the waterfront at the Sea Organ. Built in 2005, it uses the waves of the ocean to drive air through “pipes” to create an amazing sound. Steps lead down into the crystal clear water. 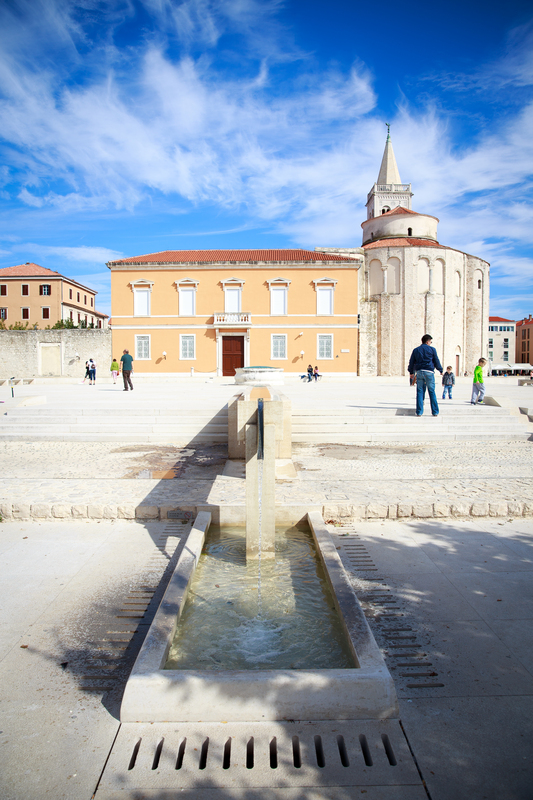 Several other places have asked the original architect, Nikola Basic, to build one in their city but he always declines because he wants it to be unique to Zadar and that it won’t work anywhere else because of the water. them in a museum. Leading from the ruins through the square is the Church of St Donatus and the Cathedral of St Anastasia, a patron saint. The Cathedral, is unlike any other Catholic church, in that you step down into it, rather than up. As we walked through the streets and several squares, we noticed a lot of people out, our tour guide informed us it was Croatia’s Independence Day and there were many festivities planned. Making our way in sort of a loop, we ended up back in the square where we began and went into the monastery at St Mary’s Church, where, in World War II, the nuns hid relics in the steeple of the church. Many of these are now on display in the monastery. After tour at the monastery, we walked around the Old City, grabbing a croissant and relaxing on the waterfront for a bit before checking out the Sea Gate and Land Gates. 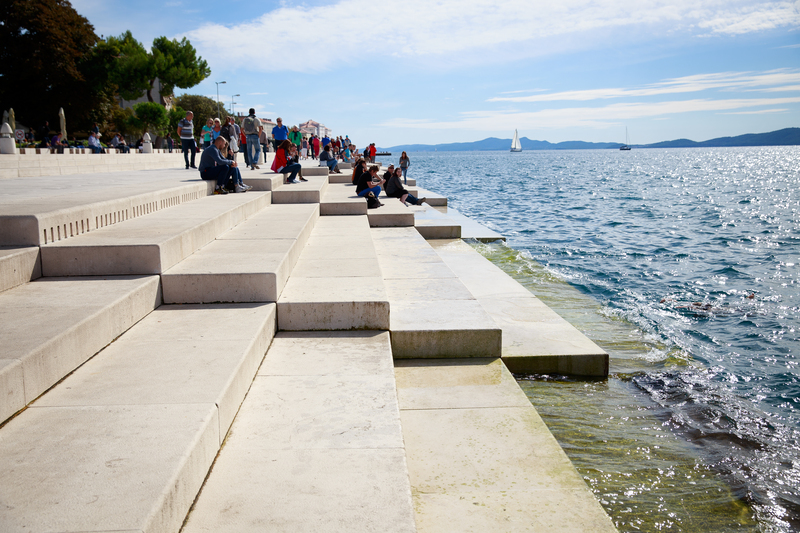 We made our way back to the Sea Organ to dip our feet in the crystal clear Adriatic waters. The water in front of the Sea Organ was probably 20′-25′ deep and you could see the bottom easily. After listening to the Sea Organ for a while, we headed to the bus stop to get back to the boat. Back on board, we grabbed lunch and then relaxed, still dragging from the time change, lack of sleep and all day exploring of Venice. We took a quick nap before watching Zadar go by as we left. Tonight was the first of 2 formal dinners on the Rhapsody. I put on my suit and Elise a beautiful dress and headed down to the Edelweiss. Andy from Scotland had on his plaid suit pants and traditional Scottish coat. Our table that had 2 seats open last night, was now full. Jerry and Brenda missed the boat in Venice as they had connecting flight issues due to the hurricane roaring up the East Coast. Getting in late, they had a driver waiting for them to drive through the night from Venice to get them to Zadar. Their luggage was lost so they had the clothes they were wearing and what they packed in their carry on. They had borrowed tuxedos from the boat to get them through until they could find their luggage. Our travel agent, when preparing for the trip and dining, told us how we might get sat at a table with some annoying people, and that larger tables were better because it spreads out the obnoxiousness. Last night, we thought we hit the jackpot with some really great people. Tonight, we met “those people” who are going to test our patience. Solar panel at the Sea Organ. Great blog with FABULOUS photos! Thanks! A lot more to come, with a full review of the boat as well!